Every year for Mother's Day or her birthday I ask my mother what she would like me to make for her special dinner, and every year she tells me baked beans and cornbread. And I sigh a little because I want to make something new and exciting! This year my mother allowed me to choose (with her final approval, of course). We decided on brunch, so I pulled out a bunch of menu options from different books. 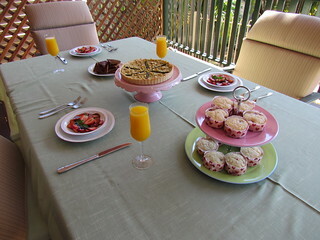 Finally she chose the Mother's Day Brunch menu from Robin Robertson's book Party Vegan. This was very exciting for me, as it was the first time that I had cooked from this book. I haven't had much time for making full menu plans lately. I actually won this book during the closing days of 2010's VeganMoFo from a competition - the only blog competition I have ever won. The book was sent all the way from Canada and arrived on the afternoon that the Brisbane floods began at the beginning on 2011. There's a certain amount of shock that sets in when you watch large parts of your city being swallowed up by water, so the book remained unread for a while. When I finally got around to reading it (I read all my new cookbooks like novels first, and cross-reference recipes within them) I was very happy. Lots of exciting menu plans with lots of make ahead and quick options so you don't get overwhelmed trying to do everything at once! And being that Robin is one of my favourite cookbook authors, I knew that it would not disappoint. It's a pretty beautiful spread, and was a lovely morning. The drinks you can see are virgin mimosa's, since I don't drink alcohol. Essentially just fresh orange juice (OK, I cheat a little and use Nudie's Nothing But Oranges so I don't have to squeeze it all out myself) with some soda water added for a bit of sparkle. Brunch started with an elegant but simple plate of thinly sliced fresh strawberries with a sweet balasamic vinegar and fresh mint. 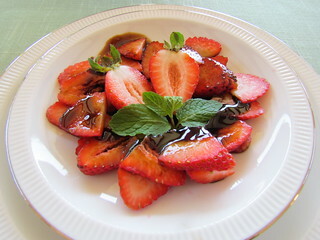 The balsamic vinegar is really delicious (just don't over cook it as it will go a bit too thick) and I have a desire to try it over vanilla ice cream. I was never really interested in egg-based quiches in my pregan days, but I love vegan quiche now. One of the great things about vegan food is that I can enjoy so many more options, as the so called 'traditional' versions would often make me feel kind of ill. Obviously my body knew I was meant to be vegan before I did! 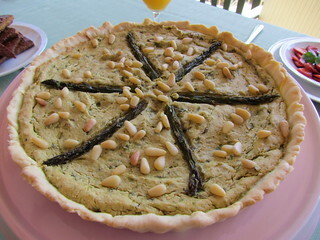 Anyway, this quiche has a filling of cashews, white beans and asparagus with a variety of seasoning in a lovely pastry crust. Tempeh bacon is hands down my favourite smoky brunch addition. I know there are various pre-made vegan bacons, but they never really enticed me. Since my first bite of tempeh bacon, I knew it was love. I make every tempeh bacon recipe I come across. 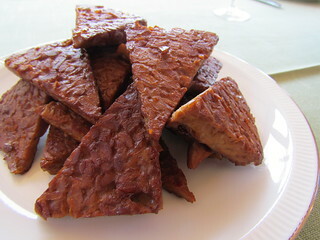 While this recipe isn't as quick as the recipe from Robin's 1000 Vegan Recipes, the marinading time is well worth it as you end up with amazing, juicy tempeh triangles. The recipe calls for 8 ounces, but here I get my tempeh 300g blocks, so to make up for the extra tempeh I used Australian tablespoons to measure the marinade, which are larger than American ones by a whole 5mL! I don't think anyone would turn away this gorgeous plate - these are two five star rated recipes right here! The muffin recipe was a departure from the menu, as my mother requested a berry muffin rather than the chai muffins in Party Vegan. Of course my very soul trembled at having to go 'off menu', but as it was her day I made these raspberry and lemon morsels from Colleen Patrick-Goudreau's Colour Me Vegan. 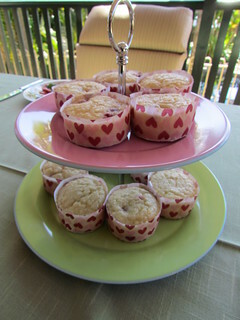 They are very moist little muffins, and are quite small in the muffin cups, but have a good flavour. 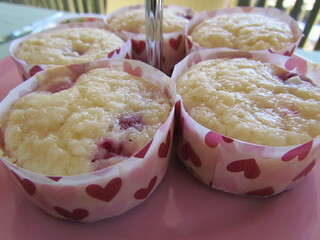 These muffins are best eating the day they are made, as seem to get a bit soggy as time goes on. Back on the menu plan with a decadent finish. 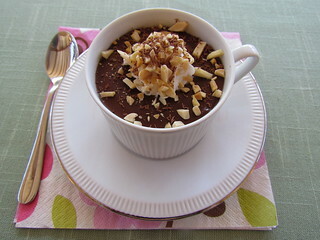 These little pots are made from melted chocolate, almond meal and tofu and are very rich. I couldn't make it through a whole one in one go, but it keeps well. These would also make some nice truffles, I think. All in all, this was a great menu and my mum was very happy with it. I found it really easy to put together in time for brunch. 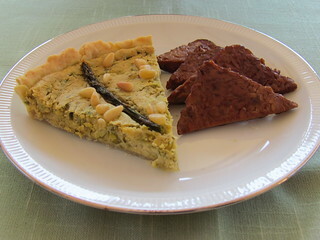 The day before, I made the quiche and refrigerated it, as well as had the tempeh triangles marinading in the fridge. I also mixed up the dry components and wet components for the muffins into separate sealed containers. In the morning I took the quiche out of the fridge to come to room temperature, then I made the chocolate pots-de-creme first as they need to be in the fridge for at least two hours (you could make these the night before but the recipe said not to refrigerate for more than 12 hours so I made them on the morning, but the leftovers were fine in the fridge for longer). I mixed up the wet and dry muffin components and baked the muffins. Then all I had to do was slice strawberries, make the balsamic syrup and fry up the bacon. Easy! I even had time to go to the gym that morning! 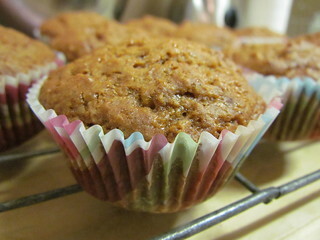 Because I wasn't able to make the muffins from the menu on the actual day, but I still wanted to complete the menu, I made the chai-spiced muffins the next day for work snacks. These have a really subtle spiced flavour that is really nice. So one menu completed, and one Mother's Day brunch success! I'm really looking forward to making more menu plans from this book. I know I am late posting this (Mother's Day was back in May), but I hope everyone who celebrates Mother's Day had a really nice day with their mothers, or their children (including the non-human kind!). 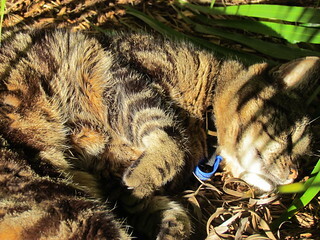 A photo of our family kitty Possum, who is enjoying a morning recline in the bark underneath the palm trees. It has been a long time between blog posts. Even after posting about losing Gizmo, it didn't seem right to just jump back in. So time has passed, just over seven months in fact. And it is still hard. But I am returning to things that have made me happy in the past, and blogging is one of them. So here we go! To mark my first blog post in a good long while, I thought I'd start with an amazing day I had recently. Every year in August in Brisbane the Ekka (short for Exhibition) is held. It's one of those country comes to the city shows, with animals, rides, show bags, produce and food. I loved it when I was little. Now, not so much. Most of the food isn't vegan, the show bags aren't vegan, and all those animal exhibits just make me feel kind of sad. Every year there is a public holiday on a Wednesday in August in Brisbane for the Ekka, so this year a few of us decided to create our own Vegan Ekka - The Vekka! The main focus was on food glorious food! The 'we' in question were myself, Arly and Kris, and Matt and James. 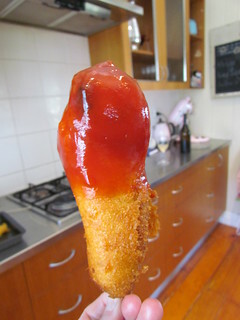 One of the most iconic Ekka foods is the Dagwood Dog, similar to the Pluto Pup, and I believe a Corn Dog in the US. 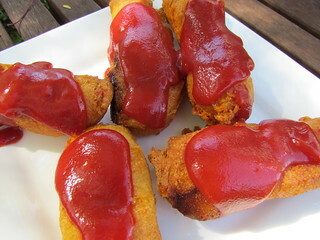 Basically you take a hot dog, dip it in batter, deep fry it and dip in tomato sauce. You can actually get Dagwood Dogs from the Ykillamoocow stall at the West End Markets on Saturdays, but these babies were homemade by Arly. And they were delicious! Normally I'm not such a fan of the Dagwood Dog as I don't love deep fried, but these were awesome! I stuck to only one, because I start to feel a bit ill if I have too much deep fried, but secretly I wanted more. Arly also made these delicious mini mince pies, also eaten with tomato sauce. I was lucky enough to have some of these little guys to take away with me and I snacked on them in the following days. 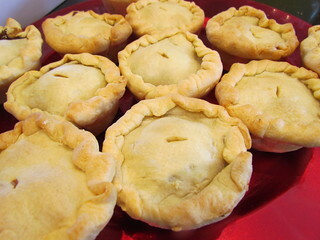 Arly is the master of mini-pies! 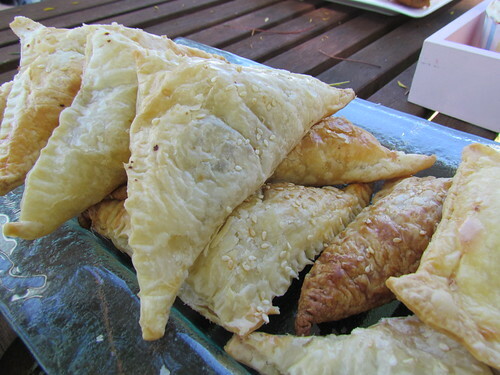 Matt and James brought these delicious spinach triangles. Also, not pictured because all the photos I took of them were blurry, some yummy seitan tenders. The tenders were pretty much all hoovered down while we were still getting the rest of the food ready to take outside. By the way, did you know that Matt and James recently launched their own Brisbane-based food business? Check them out at Delicious Regardless. Buying cardboard cups of potato chips with chicken salt and drowned in tomato sauce is pretty much a common theme of any outdoors takeaway stall ever. 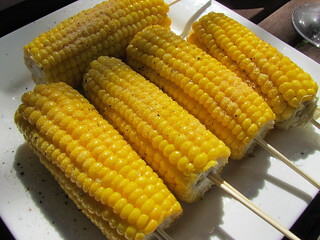 One of the stalls that is starting to pop up and fairgrounds everywhere is the Corn on the Cob stall, a welcome stopping place for vegans (as long as you make sure to ask for no butter). 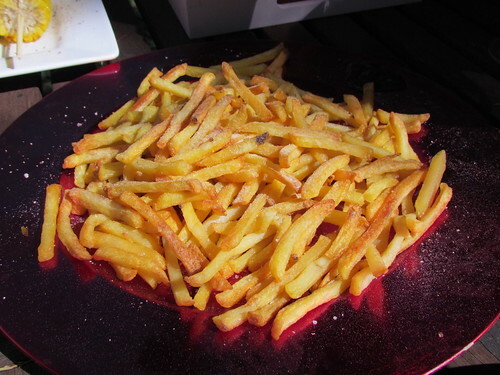 My version was roasted with Nuttelex and sprinkled with salt, pepper and garlic powder. Homemade lemonade is the best! 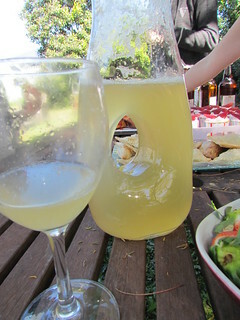 Arly made some delicious lemonade that was mixed up right before taking it to the table. 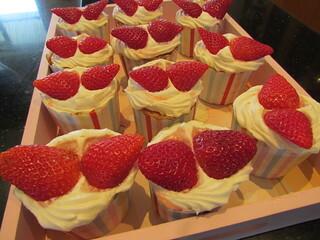 Arly made some adorable strawberries and cream cupcakes, that were delicious! Left over buttercream was served with fresh strawberries. 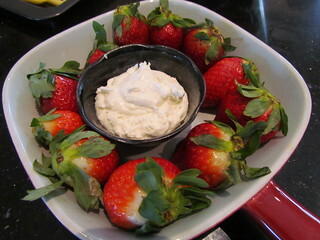 When I was younger, my favourite part of the Ekka was strawberry sundaes, and I recreated them for our Vekka. 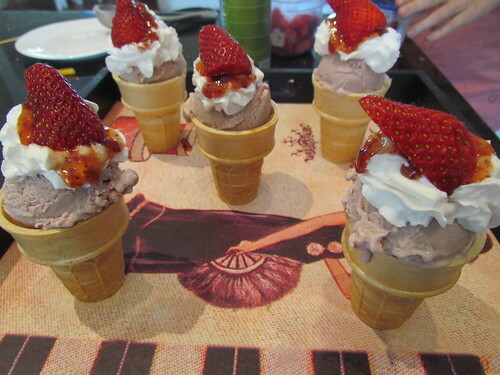 Ice cream cones are filled with chopped strawberries down the bottom, then a scoop of strawberry ice cream, Soyatoo whipped cream, a drizzle of strawberry sauce (not strictly traditional) and a fresh strawberry. For the ice cream I made Strawberries and Cream Ice Cream from Dreena Burton's Let Them Eat Vegan. Not pictured with the Spun Fairy Floss that Matt and James bought - Maple and Vanilla flavours. Way classier than the regular old fairy floss from the stalls! It was a lovely day. We ate our feast out in the backyard until we were as full as could be. Next year we are hoping to organise a bigger Vekka, with more food and maybe some events, and keep growing it more every year! 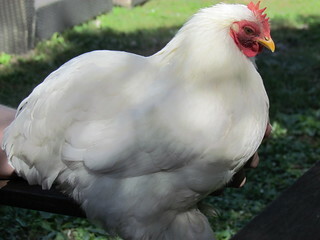 I know I normally have a kitty photo, but in the spirit of Vekka here is a chicken photo. This is Elvis! She lives with Kris and Arly and loves to be included in festivities. James is in love with her. I haven't posted on my blog for a long time. I knew that this had to be the next post I made, but it has taken me quite some time to be ready to post it. To be honest, I don't know if I'll ever be ready. But here it is. 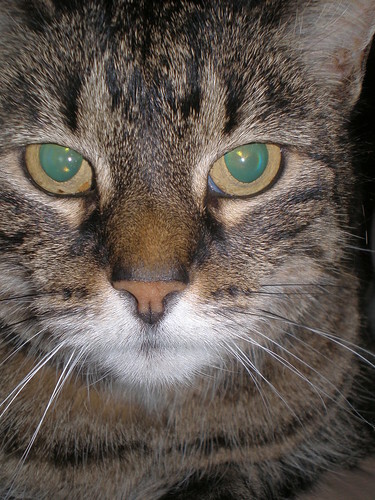 On December the 17th 2011, Gizmo got sick. The last few years of managing chronic kidney disease and recurrent urinary tract infections resulted in a very serious situation. Gizmo spent a week in hospital, before coming home for a week over Christmas. That was one of the most precious weeks of my life. 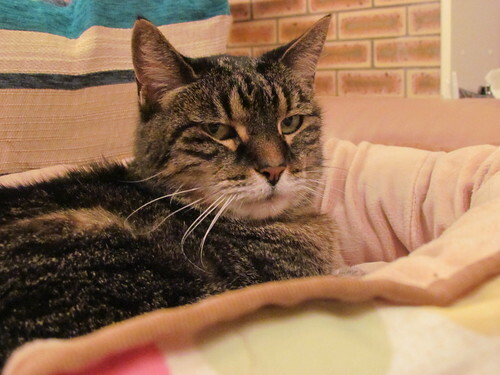 On New Year's Eve, Gizmo had to go back into hospital. The details are many, but she required surgery to remove an obstruction from her ureter, made it through, but then developed a multi-drug resistant kidney infection (from all her previous UTIs) that went systemic. I did everything that was possible to save her, but it still wasn't enough. 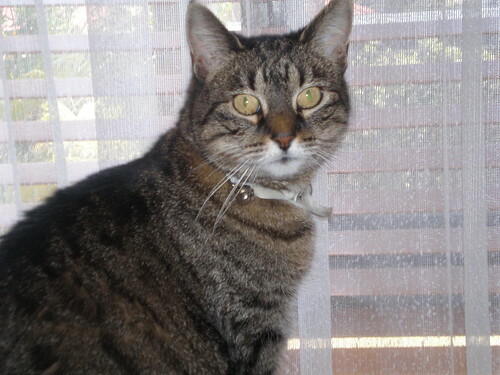 On Saturday January the 14th 2012, I had to help my darling Gizmo leave this world. It was the hardest thing I have ever had to do. She went peacefully and with dignity, at home in her birthday bed, held by me and surrounded by family. She was only fifteen years old. This is why I haven't been posting. I am now learning to face a world without Gizmo. It will be three months next Saturday, and the truth is that time has healed nothing. 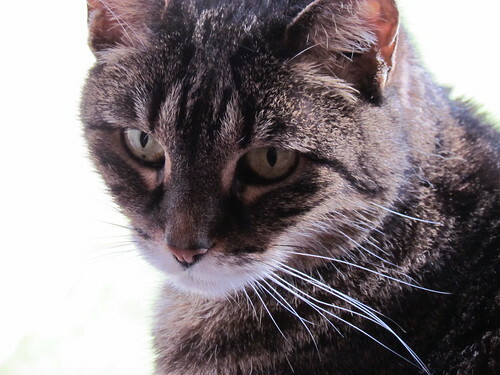 My three girls are my world and my soulmates, and now part of that world is gone. It's not something you get over. 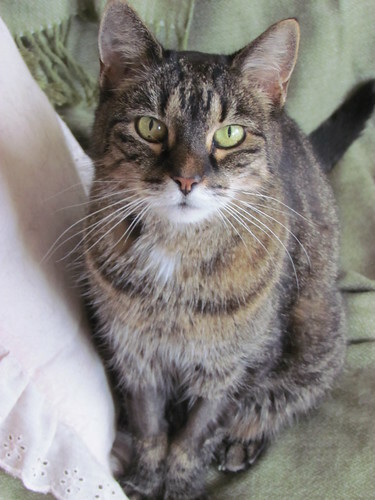 I have so much I could say about Gizmo, if I could only find the words to do her justice. 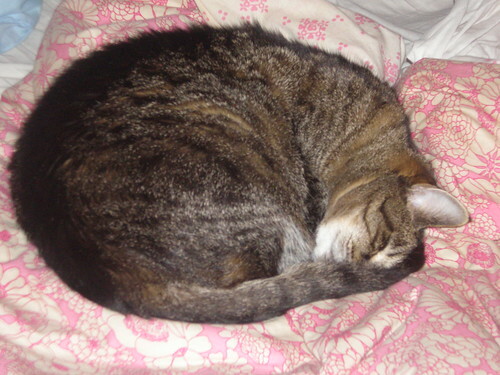 She was a cat full of kindness, love, and snuggles. Her purr could be heard from the other end of the house. She had a myriad of little habits and quirks that were precious. And she was beyond beautiful. Now the three of us are learning how we fit without our fourth. Sahara misses her friend, Dim Sim is blossoming in the absence of her nemesis, and I am just without. I have been so blessed to have wonderful friends, both in person and on the internet. People who have supported me through every stage of this journey, and continue to do so. Thank you. 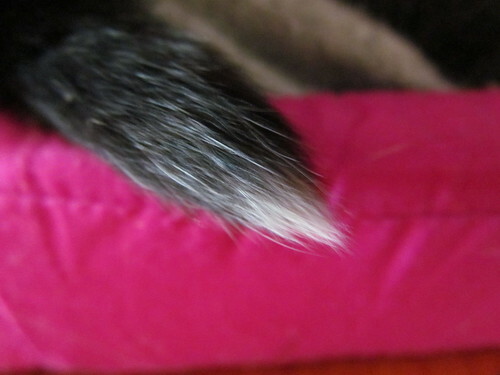 And to my Gizmo, thank you for being my friend, my guide, my love. I will love you forever, and will hold you in my heart every day until we find each other again.